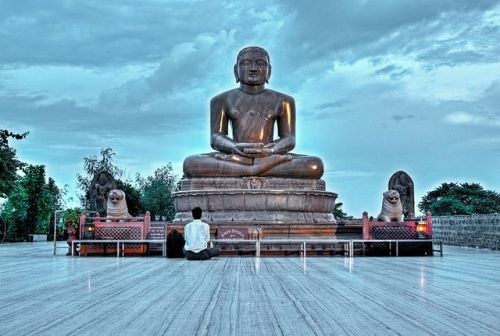 The Ahinsa Sthal is a Jain temple dedicated to the concept of nonviolence, with a massive 13.5 ft high granite statue of Mahavira, the 24th and last Tirthankara. The Ahinsa Sthal is a Jain temple dedicated to the concept of nonviolence, with a massive 13.5 ft high granite statue of Mahavira, the 24th and last Tirthankara. The structure depicts a meditating Mahavira seated cross-legged in Padmasana on a lotus pedestal, flanked by 2 ferocious guard lions. The surrounding gardens have information boards on the life of Mahavira and Jainism, as well as statues of Apsaras.